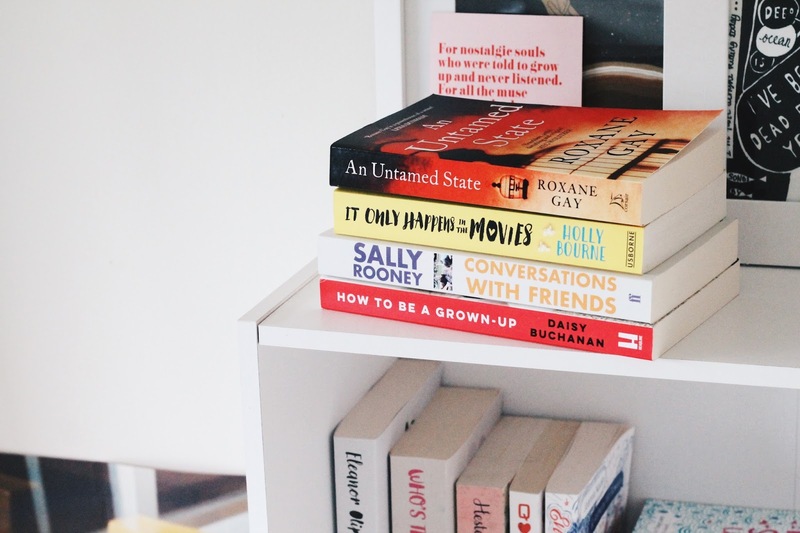 January Reads | emma etc. January was one of the best reading months I've had in a while. Although sometimes I get into the habit of reading the same type of books over and over, these four are quite different from one another. It just goes to show sometimes you should branch out from your usual genres every now and then. For the most part, I couldn't tear myself away from these books - I may have just been in the reading mood - but, I digress, if you're looking for some new books to read, I can't recommend these ones enough. I was too excited to read a new Holly Bourne book for my first read of the year. I'm sure if you're a regular reader here you'll know her books are my favourite, and somehow each one is better than the last. Not only are her books easy to read, but they explore important topics, relevant to not only teenagers but a slightly older audience. It Only Happens in the Movies is about a teenage girl who is researching about the cliches of romance movies for her coursework. Her own observations about the genre are interwoven with the main story. She meets a typical 'bad boy' at her new job, and knows she should steer clear. From the outside, this book is one big cliche, but that's exactly the point. Obviously I won't spoil it, but the ending was amazing and I was hooked until the very last page. I have to admit I was rather dubious about this book. I had bought it when Roxane Gay spoke at Auckland Writer's Festival in May last year, and there it lay on my shelves for months building dust. But when I finally picked this up at the start of this year, I kid you not, I couldn't put it down. This book was attached to me for about a day, maybe two as I became completely consumed by it. I often think if you read a book all in one go it will have a much bigger impact on you, and that was definitely the case here. This is certainly not for anyone wanting a nice, easy read. Roxane Gay's books are often very difficult to read, full of unlikeable, flawed characters, and that's exactly why you should read them. An Untamed State is about a woman kidnapped for ransom in Haiti and it follows her ordeal as she is held captive for thirteen days. It also explores the aftermath of it, and the trauma she undergoes. I have to say, this is definitely my favourite book I've read of hers by a long shot. It's intense, all consuming, and not for the easily disturbed, but gets into the mind of the protagonist so well; it is the type of book that will stay with you for a long time. I had heard a few people talking about this book a while ago, so I wanted to see what the fuss was all about. Journalist Daisy Buchanan talks about her life and gives her dose of wisdom when it comes to adult life in your twenties, from how to survive at work to how to love your body. While I found it hard to relate to some of the things she talked about from her own life, there was a lot that I did relate to and that was reassuring. In some ways I feel like I have heard most of this advice already, however as she admits in the beginning, her musings are nothing particularly revolutionary, but what she does say is like a pat on the shoulder - telling you you're doing just fine. I loved a couple of the chapters in particular; here's to more women talking about those unconventional topics. I would recommend reading this short book if you feel like you're struggling as a young adult. This was one of the most interesting, thought-provoking books I've read in a long time. I find it hard to explain why I like it, but I think the main reason I really resonated with this was because of the flawed, unlikeable characters. This makes for such a refreshing, interesting read because it shows what humans are genuinely like, instead of some perfect version of reality. People do stupid things, or act in stupid ways, but that's life. Conversations with Friends is about a group of friends who are in the poetry and publishing scene; gradually the protagonist, Frances, begins an affair with an older married man. If anything, you read this book to get inside France's head as she becomes increasingly self-destructive. The way the author frames her relationship with the married man makes for an interesting look at the nature of relationships and how we give in to pleasure. Frances is incredibly observant and her commentary is addictive to read. As I got increasingly further into this book, I felt a strange attachment to it. Overall I cannot recommend this book enough, however I suspect some people will appreciate it more than others. I hope you enjoyed this post & found something new to read in the process! im enjoying how to be a grown up a lot at the moment, keep picking it up and flicking through a few pages here and there and its got some lovely stories in it. perfect for when youre feeling a bit all over the place - we're all in the same boat! That Holly Bourne book sounds fabulous; I'm going to have to buy it straight away! The Holly Bourne book sounds like my type of book, so once I've got through my pile of 12 unread books I will buy it!